Welcome to Water Street Insurance Agency Our agency has been serving individuals, families and businesses in Massachusetts since 1989. At Water Street we work hard to ensure that each and every one of our clients has an insurance plan tailored to meet their needs; to meet their budget; to provide them piece of mind. We are a professional INDEPENDENT insurance agency which allows us to guide you through the confusing but necessary process of insurance without being beholden to ONE insurance company. We are contracted with 17 different insurance companies, so we have the ability to shop your insurance with many companies and present you with a package that caters to your unique lifestyle. You should work with an insurance agent who will provide you with courteous person-to-person service -someone who will be an advocate for YOU. That agent should be Water Street. Please allow us the opportunity to serve you. You can spend hours on the internet researching the best brand, the best coverage, at the best price -or- Call, spend a few minutes discussing your needs with us and We'll do the shopping for you. Water Street Insurance is an independent agent. Being independent is significant. It means we are not beholden to any one insurance company, and we are free to represent any number of companies. Purchasing insurance is a confusing, but necessary undertaking. As a professional insurance agent, with decades of experience, we can analyze your insurance needs and present you with an insurance package that protects you at a cost to fit YOUR budget. Insurance is "piece of mind", and your level of comfort may be different than someone else's. So whether it is for your home, your automobiles, your family or your business -we can assist you in determining the right insurance coverage for YOU. Does my homeowners policy cover damage caused by flood? Homeowners policies do not cover flood damage. You would need a separate flood insurance policy. You should know that flood insurance does not cover contents. Water Street Insurance can provide you with a quote and more information in the coverage that is provided. My registration is up for renewal. The box in the middle says 'insurance stamp not required, active policy on file.' What do I do? You just mail the whole card in (do not separate it at the perforation) directly to the Registry of Motor Vehicles. If an insurance stamp is required then the box would have stated that and you would need to visit Water Street Insurance. Do I have glass coverage on my auto if I only carry liability insurance? Only those who carry comprehensive coverage, which is Part 9 of your policy have glass coverage. If you experience a glass loss please contact Water Street Insurance for further instructions. I recently moved and was wondering do I need to contact my insurance company? I just moved to Massachusetts, do I need a Massachusetts driver's license? 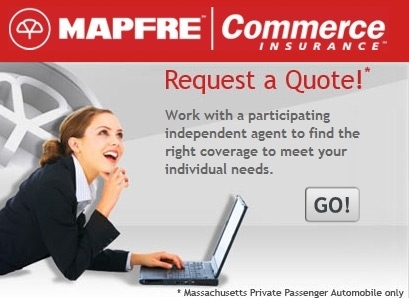 Yes, prior o getting insurance with Water Street Insurance you need to go to the Registry of Motor Vehicles and procure a Massachusetts driver's license. In addition if you are from another country then you will need your driving record (translated) and proof of your original license date. I got into an accident what information should I have collected from the other driver? Someone broke into my vehicle and stole my belongings from my vehicle. Is that covered under my auto insurance policy? No, that kind of loss is covered under your homeowner's policy.